1 of 3 Place noodles in a bowl. Boil 8 cups water in a large nonstick skillet and pour over noodles. Soak 10 minutes and drain. 2 of 3 Heat 1 tbsp of the oil in same skillet. Season beef with salt and sauté 2 minutes per side. Remove to a plate. Add remaining 1 tbsp oil. Add onions, peppers, mushrooms and garlic; stir-fry for 8 minutes. 3 of 3 Combine cornstarch and broth; add to skillet and simmer for 1 minute. 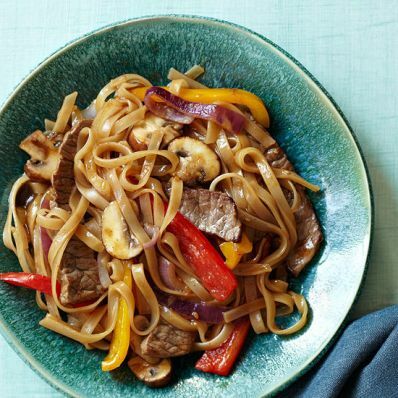 Stir in beef, noodles, teriyaki sauce and vinegar; simmer for 1 minute until heated through.